The illustrations in this picture book are fantastical, like being inside a beautiful dream crowded with animals, people and landscape. You want the dream to go on and on! Some of the pages seem to be created from paper collage, others have painted images; there are wax rubbings and inked drawings – so much to look at and take in. The cover shows a harlequin leaning on top of an elephant’s head, surrounded by all manner of creatures from a French poodle to a pink pig on an armchair to a monkey holding a small windmill. The entire story appears to happen on the landscape of the elephant’s hide. 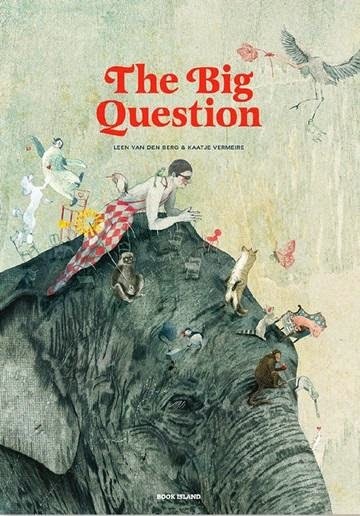 At the start of the story, elephant has something on her mind, a difficult question, a big question. At the annual meeting (chaired by an anxious ant) all of the creatures gather to find the answer. The question really is a biggie: How do you know you love someone? The mouse declares its love for the elephant, Snow White talks about what loves does to a person. And so it goes on, each creature endeavouring to give his or her answer. Meanwhile, there are gorgeous illustrations – two otters kissing, flamingos beak-to-beak, gibbons reaching out lovingly for one another, and so on. This sumptuous book was made possible with financial support of the Flemish Literature Fund; it was first written in Dutch and translated into English, then published in New Zealand. It’s not really a book for young children; its appeal is more to those with a romantic soul. My only quibble with the portrait-shaped book is that it is over-sized; librarians and others will find it difficult to fit onto shelves. Despite this, it is certainly recommended!